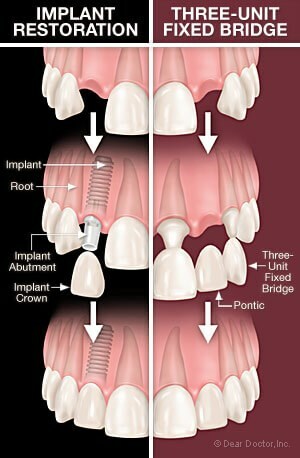 Dental implants are actually a series of procedures used to recreate a missing tooth. The key part of a dental implant is the initial titanium implant which sits in the original tooth’s bone pocket, or alveolus. The titanium works well with the bone and actually forms a bond with it over time, much like the original bond between the tooth and the jawbone. This is essential as it prevents bone loss that would normally occur with any other type of tooth replacement. Dental implants are capped with a dental crown, which replicates the enamel or visible portion of a tooth. In many cases the replacement tooth will work just as well if not better than the original tooth. The false tooth or teeth literally bridge the gap between natural teeth. For a long time, fixed bridges were the best alternative for people who had lost teeth, as they were quite successful and aesthetically pleasing. Unfortunately, bridges can also present some problems because the natural teeth that lie on either side of the bridge are filed to accept the appliance. This step in the bridge-making procedure may make these teeth prone to bacterial plaque accumulations, decay, periodontal disease, and the possible need for future root canals. At first glance, it appears that a bridge is the more economical route, with total fees for a typical implant starting at the top end of the cost for a fixed bridge and ending a couple thousand dollars higher. But when comparing cost versus value, the dental implant is more cost effective and the better treatment option — if the patient is a candidate for implants.